Florence Private Tour, A Gourmet Tour Includes: Service of an expert guide. NOTE: Special tastings and lunches can be arranged. Customize this private tour in Florence according to your interests. This uscale Florence food tour, a unique Florence private tour focuses on the Italian culture on food and wine. This Florence food tour will immerse you in the Italian culture, and food and wine of Florence and Tuscany. Discussions about food, wine, markets, the local culture over coffee, and aperitivo, and lunch, and deserts is a fun way to experience the Italian culture. This unique Florence food tour starts with a stop at a historical coffee house and learn how the Italians do caffè, and hear a talk on the local culture with regards to food and wine. This Florence private tour will also visit a market in Florence with an amazing representation of fresh produce, meats and cheeses. In this fun private walking tour of Florence, you will have the opportunity to sample artisanal cheeses, chocolates, wine, balsamic vinegars, olive oil, cured meats and more. After stopping at markets and specialty shops, you will continue on to one of our favorite places, a hidden gem, where you will have your aperitivo followed by an authentic lunch (offered in the 6 hour tour only) with wine. During lunch, your excellent Florence tour guide and the charming owners will share their insight into the local culture of food and vino with you. To satisfy your sweet tooth, a stop at a chocolate shop in Florence for their artisanal handmade chocolates are included and after lunch a stop for amazing gelato. 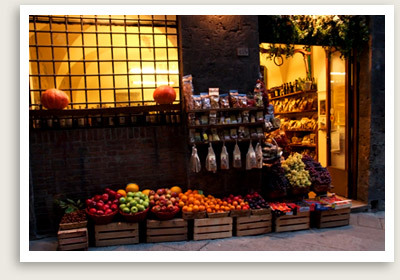 This tour will also take you to specialty food shops around Florence. You will end this fantastic tour at one of our favorite wine bar where you will learn more about Italian wine during your relaxed and fun session of wine tasting in Florence. Note: Order of some activities may change. Book early. Guides are limited.